Gulf South Aperture: Pink in the Rink with the Surge! Pink in the Rink with the Surge! Click the link to view the Mississippi Surge gallery. So football season is over and you can always look forward to an event going on here on the coast, but what is the best thing to replace that empty space in your heart where hard hitting sports usually fill? Come to a Mississippi Surge game at the Mississippi Coast Coliseum, they would love to hear you cheer and support their wins. The Surge is always supporting community efforts and events, so I decided to feature just a few. 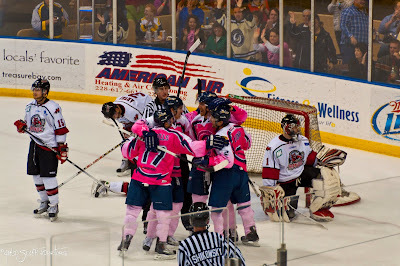 The game I cheered on, "Pink in the Rink", the Surge dawned pink jerseys on the ice against the Huntsville Havoc pulling a win of 3 to 1. The pink jerseys were then auctioned off at The Hard Rock Casino to help provide financial assistance to patients receiving breast diagnostic imaging services such as mammograms, breast ultrasounds and breast MRIs whom otherwise cannot afford these services. 100% of the contributions to this fund go directly to assist patients in our community. Thanks to the generosity of the fans, players and leadership over $75,000 has been raised through “Pink in the Rink”, mostly through the jersey auctions, and has assisted over 300 women in need of breast imaging. Members of the Mississippi Surge hockey team also spent part of their day at Gulfport's Memorial Hospital Wednesday February 9th. They were there to meet with several breast cancer survivors and take a tour of the women's diagnostic center that specializes in detecting and treating breast cancer. I was invited to that awesome game by Kim and Billy Driebergen, who are season ticket holders and huge supporters of our Mississippi hockey team. They also run a 501c nonprofit in the honor of their son Chris Driebergen whose flourishing and talented life was taken much too soon. The hope is through their Foundation, they can continue to inspire and encourage the youth of the Gulf Coast by raising funds for child advocacy and protection programs, music and arts enrichment, and athletic and academic development. The Surge helps them do that by working in coordination to help promote events like Vancleave Night Saturday February 19th at the hockey game. Students from Vancleave Lower Elementary will kick the night off with their performance of the National Anthem, Elley Duhe will perform during intermission, and the Vancleave High School band will be there to provide music throughout the game. Money from the tickets sold goes to help build a soccer field for kids in Vancleave. I encourage everyone to go out and support their Mississippi hockey team, because this is only a small testimony of what they have done for us. You can get a schedule of the games at the Mississippi Surge website. So come out and support YOUR Mississippi Surge!